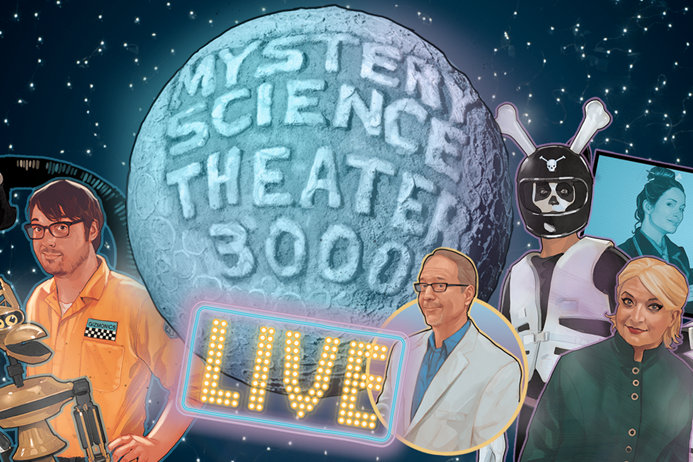 The live show at the Keswick Theatre is just the second stop on the MST3K Live! “Watch Out for Snakes!” tour. Mystery Science Theater 3000 is one of the great touchstones of American nerd culture in the last 24 years. And like most of those touchstones, it was recently rebooted for a new season. Now MST3K, as its fans call it, is headed to Philly for a pair of live shows at the Keswick Theatre on July 7. Tickets go on sale Friday, May 19. MST3K’s premise is as simple as it is silly: A janitor (first creator Joel Hodgson, later Mike Nelson and now Jonah Ray) is shot into space by mad scientists. In order to stay sane on his journey, he watches a series of laughably bad B-movies, along with robot friends Crow T. Robot and Tom Servo, who crack wise along with him. The series got its start in 1987 at a UHF TV station in Minneapolis, with the movies mostly drawn from the station’s movie library. It was a staple of Comedy Central’s early years, continuing to exist in various forms throughout the ‘90s and early 2000s and subsequently influencing an entire style of comedy. Both RiffTrax and Cinematic Titanic were created by MST3K alumni. Following a hugely successful Kickstarter campaign that started in late 2015, the series returned for a highly acclaimed new season on Netflix earlier this year, with present-day nerd luminaries Ray, Patton Oswalt and Felicia Day filling out the cast. The live show at the Keswick is just the second stop on the MST3K Live! “Watch Out for Snakes!” tour. There are two separate shows: The 7 p.m. show will riff on the 1962 horror film "Eegah: The Name Written in Blood," the subject of a classic episode of the series, while the 10 p.m. show will feature a “secret surprise film.” The two shows are ticketed separately. Hodgson and Ray are listed as participating; it’s unclear who from the rest of the cast will take part. Tickets for the MST3K Live shows are available here and here.